Hey Joomlers, today I am going to share with you a trick to increase revenue on your Joomla website. So basically, we will try to convert those visitors into customers or subscribers who are exiting from your website. So now the question is how? The answer is by triggering Exit Intent Popups when they are leaving your website so you can't miss the last chance to grab them. Exit Intent popups are popups that are being triggered at the time the visitor is leaving the website. So technically, it is the last chance to engage your audience before they leave your site. You can keep them reading your articles or browsing your website, or subscribing your newsletters or you can show them any offer for your products. Typically, an Exit Popup includes a message, a call to action button or a form or may have videos or images. Moreover, if you want to convert leaving readers, you need to create attractive as well as engaging Exit popups so the user can engage with them. There are lots of ways you can use Exit intent popup to increase your revenue or performance of your website. If you want to collect emails or leads from your readers or visitors without compromising with user experience, show them your opt-in form at the time when they are leaving from your website. This way, they will stay little more on your, and there are 60% chances they will fill their details in your opt-in form. This way you are increasing your leads and decreasing the bounce rate on your website. You can use Exit popups for your e-commerce website and increase your revenue by running sales and promotions campaigns on Exit popups. With any reason, if any user is not purchasing your product and he is leaving from your website, you can show them a deal before they are about to leave your website and most probably they will convert if they will be interested in your product. The survey helps you to improve your website performance and user experience. You can ask your users about their experience along with some other questions when they are leaving from your website. This will help you to gather information about their experience about your website or any product. Exit Intent Popups can be used to show warning messages to the visitors who are leaving from your website. For example, if you are running an eCommerce website and running a promotional campaign, you can warn your users that if you leave the website, you can’t avail the discounted price again or something like this. You can divert your visitors when they are leaving your website to another website by showing them an engaging popup at the time of leaving your website. Now the question is how to make your exit popup more engaging? You need to keep these points in your mind at the time of designing exit-intent popups. How to add Exit Intent Popup in Joomla Site? There are lots of ways to add Exit Intent popups. But, first of all, you need to know how this popup works. I am not digging more into the technical part, but just telling you that it appears when the user decides to exit from your website and move their cursor from webpage to the browser. In short, it can be a complicated task if you don't have enough coding skills. But don’t worry, here I came up with a simple solution which will help you to sort out and configure Exit popup even if you don’t have any technical skills. 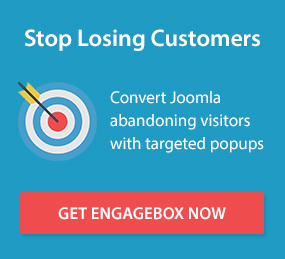 EngageBox is the best Joomla Popup and lead generation extension which helps you to convert your visitors into subscribers or possible customers. With the help of EngageBox, you can create attractive newsletter subscription boxes, trigger Facebook Page Like boxes in Popup and can do much more. If you want to know more about EngageBox, you can have a look at its demo. With the help of EngageBox, you can trigger the following popups. How to configure Exit Popup with EngageBox? If you downloaded the EngageBox Joomla extensions, install it with Joomla installer and follow the below-given steps. Go to Component > EngageBox. Here you have to create a new popup, or if you want to trigger existing popup, you can edit that as well. Click on New to create a new popup. Here you can design your desired popup and have to make all the settings. For example, I want to trigger a Sales banner when a user is leaving my site. I will choose Box Type = Image. On the selection on Box type, the default options will be replaced with the selected box type options. Give a title for the popup so you can identify your popup if there are lots of popups. For Sales banner, you have to upload a banner which will be visible to your visitors. So make sure it is enough creative and engaging. You can either upload an image or enter an image URL. Make all the necessary settings like banner width, height, what will happen when a user clicks on the banner etc. Till the step 4, you have created a creative popup. Now you have to trigger when a user is about to leave your website. To do this, you have to go Trigger Tab. First of all, you have to choose the banner position. Now, Select on Page Leave (Exit Intent) from the dropdown for Trigger point and you are done with setting an Exit intent popup. There are lots of options to customize the appearance of your EngageBox popup. You can play with them. At last, click on save and close and check out on the front end. The popup will trigger when you try to leave the website. Want to explore more about EngageBox, Check out its Demo and if you want to know how to configure other settings check out its documentation. This is how you can create an exit intent popup in your Joomla website and can increase your site performance and revenue.